*Up to 2 hours (does not include set up time), $25 for each additional hour - $45/hr if requested day of the event. DOUBLE TIME TO 4HRS rental FOR ONLY $50 prior to event date!!! We recommend that all movies to be shown in public be registered through www.swank.com . Customer is responsible for all licenses or permits needed. 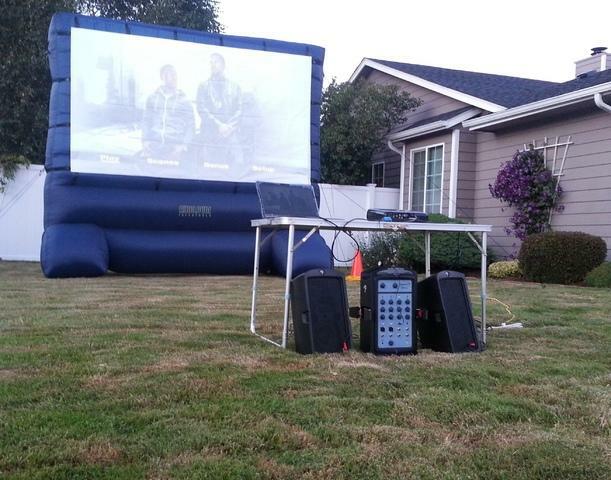 Backyard outdoor movie nights are so much fun. We rent out a huge 12ft wide inflatable movie screen that can be set up in backyard, bright / great quality Epson projector, along with 150watt clear sound surround system. It also comes with a Samsung blu ray DVD player or you can hook up your laptop to play movies or shows from. Perfect for a football / basketball game night, movie night under the stars, or hook up your PlayStation or Xbox. If you are doing a movie night, don't forget to rent our commercial popcorn machine, just like they have in movie theaters but smaller under Concession tab on our home page. Just like they had it on the old days with drive in movie theaters but a private backyard movie night for you and your family. Private viewings don't require licensing from movie companies but if you want to play a movie or a show for public, you will need to obtain licensing / rights from swank.com or another company which you will have to pay for to them (can be spendy). Contact them for pricing.